Neutrons and Protons – do they have a structure? As early as 1961 a paper appeared in Discovery magazine by Professor EHS Burhop of University College London suggesting that protons and neutrons were in fact not fundamental particles but that they had a structure. In 1964 Murray Gell-Mann and George Zweig proposed that all hadrons (mesons and baryons) were composed of particles that they called QUARKS. These were finally discovered in 1975 and at the present time (2002) are thought to be the fundamental particles of matter. One of the most unusual properties of quarks is that they have fractional electric charge compared with the charge on the electron of -e.
Their existence was confirmed by high energy electron scattering from the nucleons. There are actually six quarks and their anti-quarks but in every day life we are only concerned with three types: the up quark, the down quark and the strange quark. Quarks are held together to form larger particles by the strong force produced by the exchange of gluons between them. 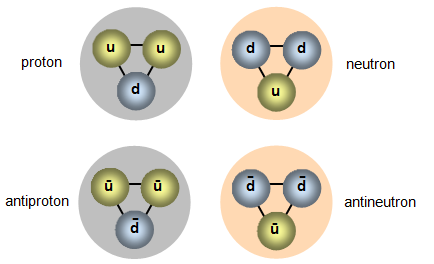 For example, it was found that protons and neutrons are formed by three quarks. It has proved very difficult if not impossible to obtain an isolated quark. As you try to pull them out of the proton or neutron it gets more and more difficult. Even stranger is the suggestion that if you could pull a quark out of a proton it would immediately form a quark- antiquark pair and leave you with a quark inside the proton and nothing outside – status quo! The reason that it is impossible to get a quark "on its own" is because as you try to separate them from each other the energy needed gets greater and greater. In fact when they "break apart" the energy is sufficient to create two new antiquarks and these join to form pions and so the quarks "disappear"! All baryons and antibaryons are made up of three quarks. You must be careful that you are clear of what diagrams that show three quarks IN a proton or a neutron are supposed to explain. The three quarks ARE the proton or the neutron but the drawings just help to show this. When you try and drag a quark out of a proton the strong force gets bigger and bigger – rather like the force in a spring as it is stretched. The "mass" of the up and down quarks is 360 MeV. Three of them in a proton gives a mass of 1080 MeV. The mass of the proton is around 930 MeV giving a sort of binding energy of 150 MeV. The quark nature of the proton and neutron can be used to explain beta decay. 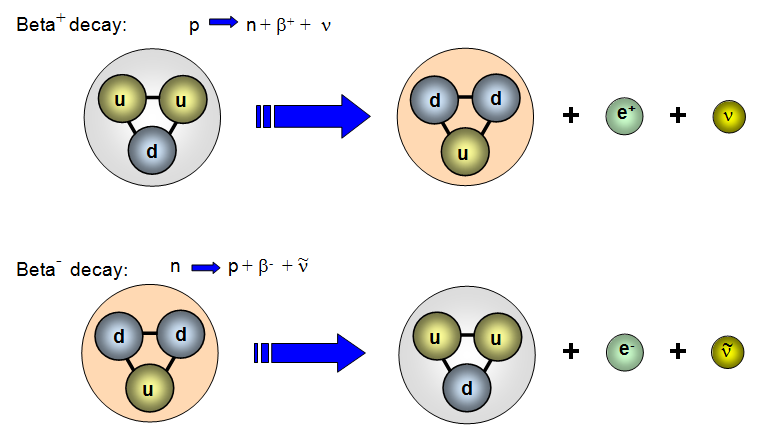 In beta plus decay an up quark changes into down quark with the emission of a positron and a neutrino, while in beta minus decay a down quark changes into a up quark with the emission of an electron and an anti-neutrino. The quarks are held together in the nucleus by the strong nuclear force. This acts only over a very short range, around 10- 15 m and is also responsible for holding the neutrons and protons together in the nucleus. It is thought that the force is carried by the exchange of virtual particles called gluons! These are allowed to appear and disappear as long as they do not violate Heisenberg's uncertainty principle. This means that the particle can exist for a time of Δt as long as its energy is no greater than (h/2π)/Δt or more usefully it can have an energy of ΔE as long as it exists for less than (h/2π)/ΔE where h is Plank's constant (6.64x10-34 Js). Baryons are composed of three quarks while mesons are composed of two quarks. One of the quarks in any meson is an anti-quark. For example a π+ meson is composed of one up quark and one anti-down quark.